Caboto? Cabot? Gavotto? Caputo? Gaeta? He was Chief Pilot of the Kingdom of Castile for thirty years and he is said to have drawn the first globe, yet we don’t even know his name for sure. We only know that the man known as Sebastian Cabot, son of the explorer John Cabot, was born in Venice around 1477–1484, and that he soon moved to England. Throughout his life, he served both England and Spain as a cartographer and an explorer. Some say he was a swindler, a liar and a schemer. When Jorge Zentner began working on the text for the book, he immediately realised that the “historical fiction” he was dealing with was rather a “mystery fiction”. It was impossible to write a biography: it was like sailing unknown seas relying on very few, incomplete and inaccurate maps. So both the author and the artist decided to take advantage of the lack of trustworthy and consistent records to base this work around the idea of mystery. Their reflections on the possibility of telling this story arise from the slow monologue of the narrator, who has to deal with a biography full of holes, the same holes appearing on the maps drawn around the end of the 15th century, where large unexplored areas were left blank or covered with a question mark. 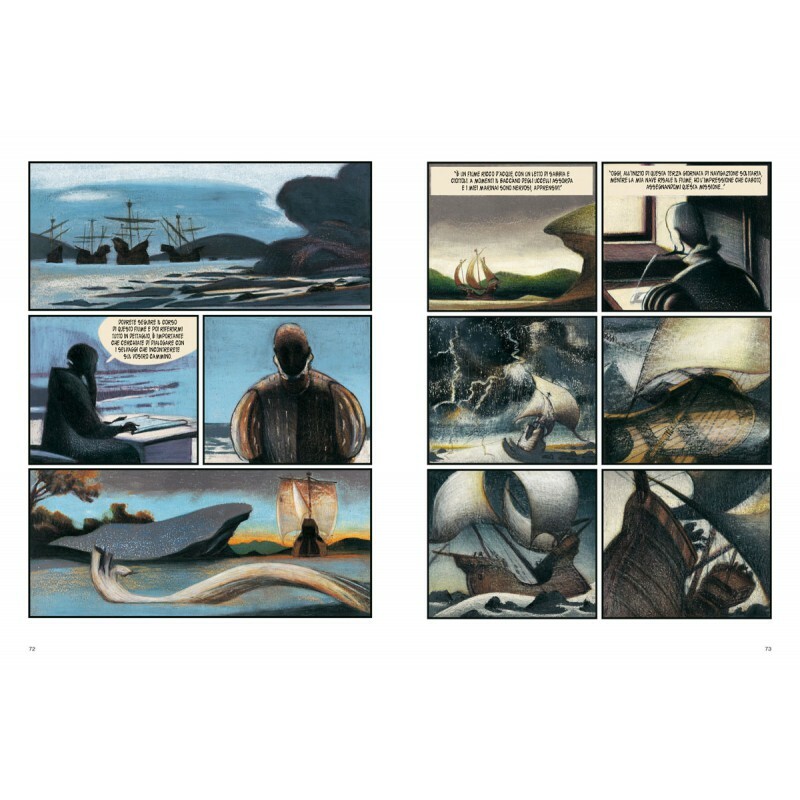 Sharing his stream of consciousness with the reader, the narrator tries to explore the darkness of Cabot’s – as well as his crew’s – mind and at the same time he reflects upon the difficulty of telling a story and the need to make choices, deal with contradictory sources, intertwine several, individual destinies, while being unaware of the boundaries between historical truth and one’s own imagination. The core adventure of the book begins on April 3, 1526, in Sanlúcar de Barrameda, with the mission of finding a way to the Maluku Islands, in the land of spices. The ships arrived to the coasts of Brazil, in the region of Pernambuco, where Cabot gathered his lieutenants to communicate them a change in plans: he wanted to explore the Río de la Plata. The reasons behind this change of course are unknown: some talk about a navigation error, some hint at a secret deal with King Charles I, others see in it the man’s economic ambition, nurtured by the stories told by those who survived previous expeditions. Yet, beyond the events, what arises from these pages is Cabot’s strong and enigmatic personality, a symbol of imperialism that reminds us of Dante’s Ulyxes, the embodiment of ambition and human thirst for knowledge. 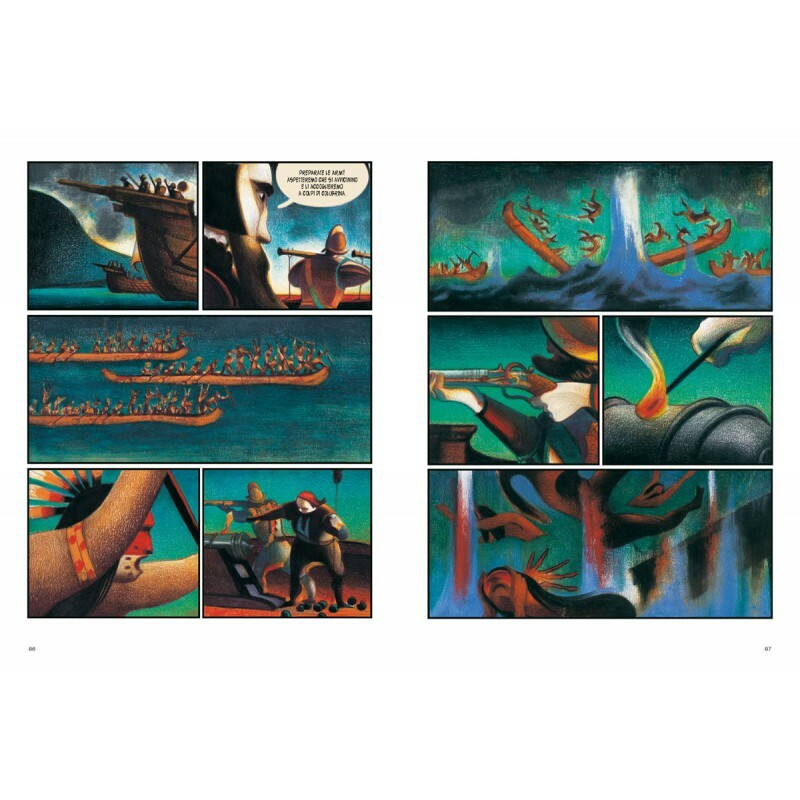 Mattotti illustrates this story with pastels and coloured pencils, recalling 16th and 17th century paintings (especially those by Caravaggio and Velázquez), as well as movies such as Aguirre, the Wrath of God by Werner Herzog. 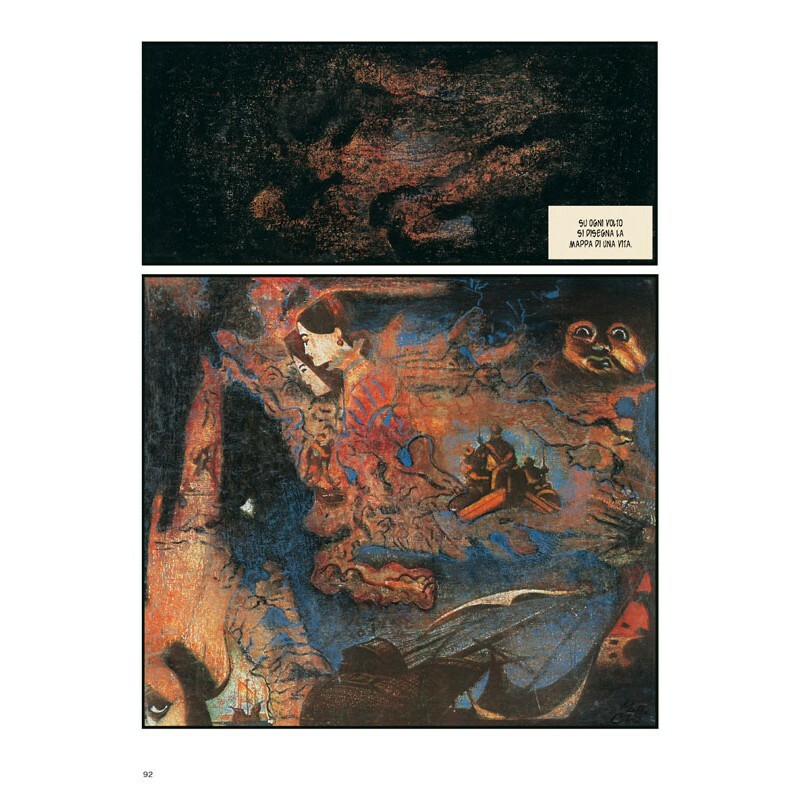 He even combines some images with coloured copies of historical documents, which he retouches to emulate the dusty look of ancient manuscripts. Wide landscapes dominated by dark tones invite us to give up any reference point and dive into the heart of darkness, losing ourselves in a one-way trip to the unknown. 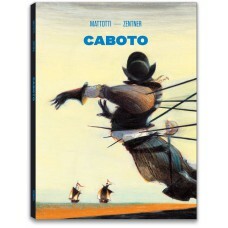 Caboto is Mattotti’s first historical work, commissioned by the Spanish publisher Planeta to celebrate the 500th anniversary of the discovery of America. 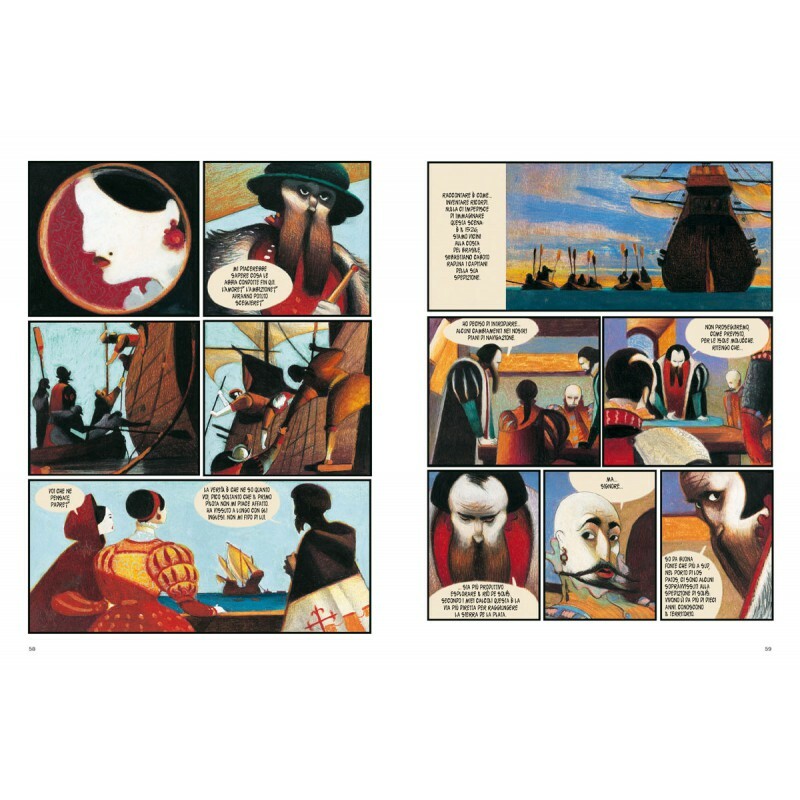 First issued in Italy in 1997 by Hazard, this book is now republished as the third volume of a series presenting the artistic evolution of Lorenzo Mattotti as a comic author. With the publication of Ghirlanda, winner of the Gran Guinigi Award 2017, Mattotti was back to comics after almost fifteen years. 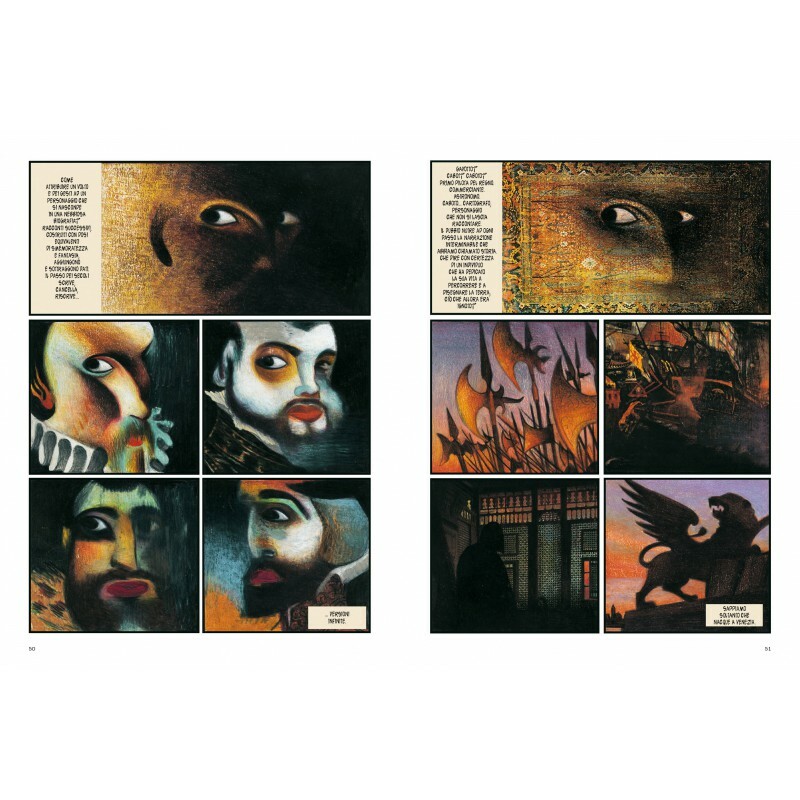 To celebrate this return, #logosedizioni launched this collection in March 2018 with L’uomo alla finestra (The Man at the Window), followed by Stigmate (Stigmata). The fourth title, Lettere da un tempo lontano (Letters From a Faraway Time), will be released in spring 2019, followed by La zona fatua (The Fatuous Zone), Il signor Spartaco (Mr Spartaco), Labirinti (Labyrinths), Chimera, and Doctor Nefasto. These volumes are presented with a new layout and in a larger format, accompanied by unpublished contents. Jorge Zentner was born in Argentina in 1953. In 1977 he moved to Barcelona, where he still lives. He spent many years reading and writing, publishing books for children, teenagers, and adults: novels, short stories, poems, essays, literary reviews, and above all comics. He has written several scripts for comics illustrated by Rubén Pellejero, Lorenzo Mattotti, Carlos Nine, Marcello Quintanilha, David Sala, Bernard Olivié, Aude Samama, and many others. More than a dozen years ago his life changed radically: he quit writing and turned to existential counselling, helping people to achieve self-knowledge, emotional re-education and creative expression.